As a follow-up to my previous post, Perpetual Money vs. Perpetual License, I thought I’d take a few minutes to further explore the math of software annuities. It turns out that 100 + 20 + 20 + … is worth 220 units. Recall in the prior post that we said sales commissions typically run 10% and are paid on license and first-year maintenance only. Thus, the company pays commissions on the 120 year-one units, which represent only about 54% of the value of the contract. Now let’s see what a SaaS annuity is worth at 50 units per year. The answer: 300 units. More interestingly, let’s find the breakeven point between the SaaS and the perpetual model (i.e., where 100 + 20 + 20 + … = X + X + …). The answer: 37 units. That is, a SaaS annuity of 37 units is mathematically equivalent to a perpetual fee of 100 with a maintenance annuity of 20 in perpetuity. Note that all these calculations have been based on a 90% renewal rate. Let’s see what happens if the renewal rate drops to 80%. 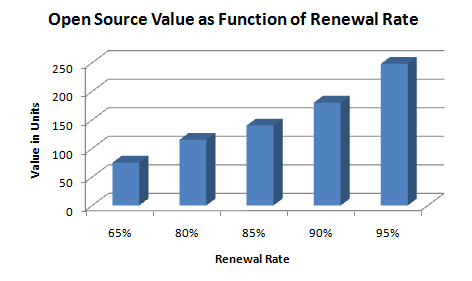 So, unsurprisingly, the large up-front payment in the perpetual model acts as a keel on the total value, damping the volatility of the renewal stream’s value as a function of renewal rate. 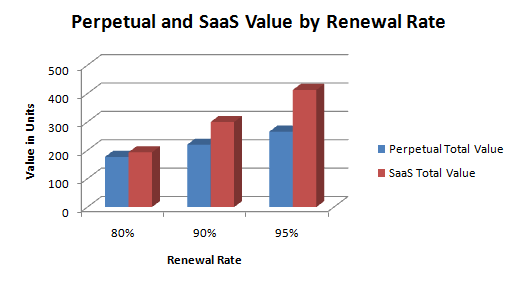 But – back to plain English – you can see why SaaS companies are so focused on renewal rates: increasing the renewal rate by 5% increases revenue by 38% over the long term. That’s leverage. Let’s say a piece of enterprise software costs 100 units and comes with a 20 unit annual maintenance obligation. We know that’s worth 220 units in total. If you sell the open source support subscription for the same price as perpetual maintenance fee, then the value for the company is 120 units and the customer “saves” 46% — and all of it up-front – by avoiding the initial license payment. Let’s say we decided to sell our open source subscriptions for 30 units and see what happens as we vary the renewal rate. Now you can see why open source vendors are so focused on renewal rates. What’s more, when a SaaS customer fails to renew they need to stop using the software. When an open source customer fails to renew they simply downgrade to using the unsupported or community-supported open source version of the software, which is a far less dramatic alternative. This is why open source vendors work so hard to justify the upgrade to their supported enterprise versions. With a renewal rate of 95% the value is 248 units. If that rate drops to 65% because many people feel they can get by with the community version, then the value drops to 75 units – a difference that could decimate a company. As one friend in the open source business said: “it’s hard work giving away your software.” Remember that while MySQL was ubiquitous at the time of its $1B sale to Sun Microsystems, there were rumored to be doing only about $65M in annual revenue. Such is the nature of disruption. I really enjoyed your presentation of these models. For a while, I have been interested in is modeling how an SaaS company could increase its revenues by also offering an open source solution as a deployed alternative for customers that can’t or won’t do SaaS. Not offering a deployed solution, and only offering SaaS. This model quickly gets complex, especially when factoring in pros and cons of the open source community, and support costs. I am not sure there is a one size fits all answer, but its an interesting thought experiment none the less. My guess is that would be difficult not for business but technology reasons. Multi-tenancy brings an extra layer of complexity (and benefit) to SaaS users and just taking SaaS application code and open sourcing it would result in  potentially giving away some cool multi-tenancy IP and  extra complexity in the open sourced project — i.e., there’d be a bunch of code and/or wierd metadata-driven database schemas that are wholly unnecessary if I’m deploying on premises. Net: I don’t like mixed models. Even as typed that answer, I didn’t like it. And I think the aforementioned technical hurdle is real.